Women on a Mission: Mom Edition: How to Make a Poster...and try to get on TV. 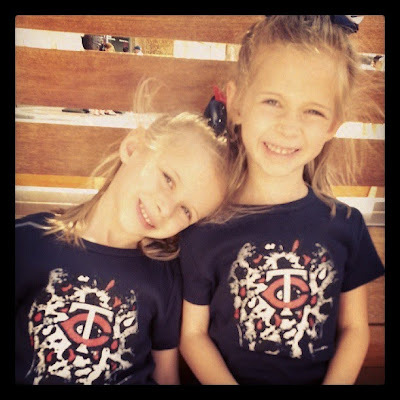 We went to the Minnesota Twins baseball game with my dad last weekend – and it was the girls’ first foray into professional sports. Naturally we went all out. 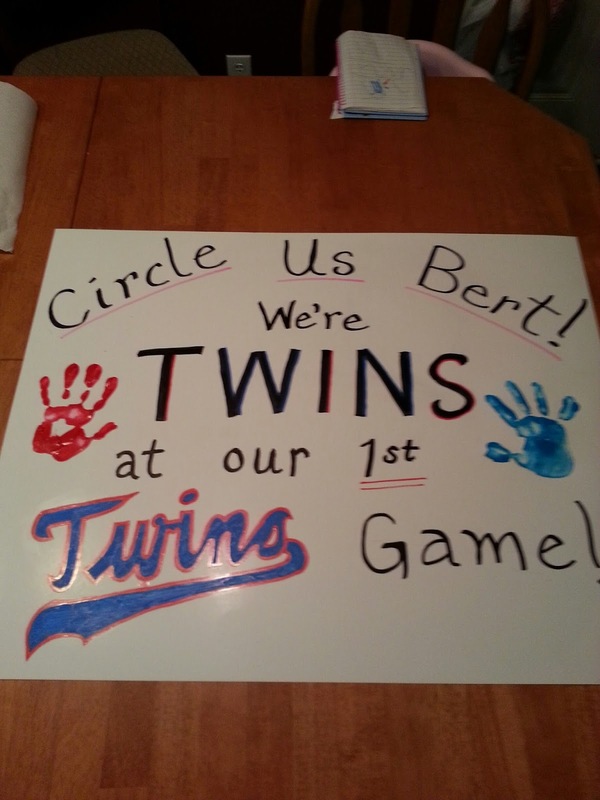 I made homemade hair bows, Grandpa got them matching Twins shirts, and we made a sign to try to get them on TV as twins at their first Twins game. I don’t normally dress them as twins. It happens only a couple times a year actually. I usually let them dress themselves, and that means they look like clowns – Lori can attest to this. But Grandpa had been dreaming of taking them to their first game since they were wee little babies, so this was a big dog deal. In fact, when I was painfully huge pregnant with them, we went to a game and I wore a shirt that we drew on that said “These twins are Twins fans”. No need to point to point to my belly. It was obvious I was about to explode. If I got on TV that game, Good Lord help us all. So I figured if I was going to have to wrangle my children for nine innings, I may as well try to get them on TV. So I put my cheerleading skills to work, pulled out the colored markers (paint pens), some white tagboard, Shaun’s sketching skills and got to work. The key is centering what you want to highlight as your most important words, writing things out in pencil first just to make sure you have it right, then writing it out in marker. I find that black is almost always best, but then accenting in color is a good way to pull out some depth. I’m no artist, but I was a darn good poster-maker back in the cheerleading days. And we’re talking life size posters. I determined that I wanted “TWINS” to be the most important centered word, and that I wanted the MN “Twins” to be in one of their logo styles, which is where Shaun’s sketching skills came into play. “Circle Us Bert” was at the top in a curve. He’s the announcer who does the fan circling on TV. The rest of the words I filled in from there. We held the poster up at each break in the play and…never got on TV. BFF Slags watched from home to verify. 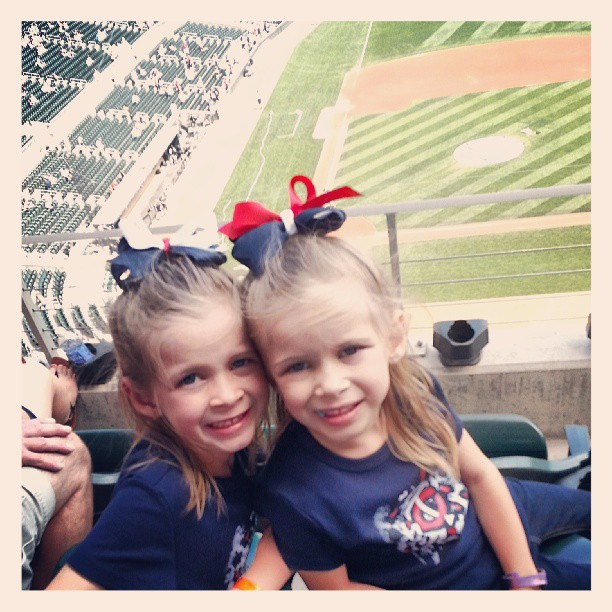 The girls were really good at the game, surprisingly, and Grandpa couldn’t have been more thrilled to have his grandbabies on his lap at their first Twins game, just like he’d dreamed. And, bonus, since it was kids’ day, they got to run the bases after, so we adults got to go down on the field too. Pretty cool. Still, I’da liked to be on TV.